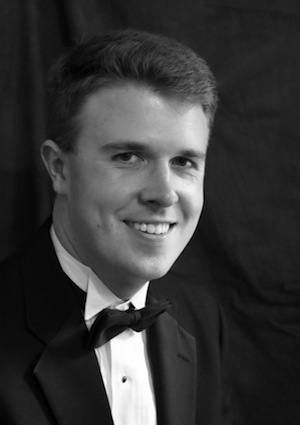 Colin Britt, originally from Maine, holds a bachelor's degree in music composition from the Hartt School and a master's degree in choral conducting from Yale University. During his time at Yale, he studied conducting with Marguerite Brooks, Jeffrey Douma, Simon Carrington, and Masaaki Suzuki. He conducted the Marquand Chapel Choir and served as assistant conductor with the Yale Camerata. At Hartt, he studied composition with David Macbride, Ken Steen, and Larry Alan Smith, and orchestration with Steven Gryc. He studied piano with Margreet Francis, voice with Wayne Rivera and Cherie Caluda, and conducting with Edward Bolkovac. Prior to entering college, he studied piano for many years with Brian Franck in Auburn, Maine. His compositions have been performed by ensembles at Westminster Choir College, Hartt, Yale, and throughout the state, including the Hartt Chorale, the Yale Schola Cantorum, and the Greater Middletown Chorale. In the 2008–2009 season, he was the composer–in–residence for the New Haven Chorale. His works have been performed in several states and by ensembles touring China, Austria, Hungary, and the Czech Republic. His choral compositions are published with Alliance Music Publications. Also active in musical theater, Mr. Britt has directed music for productions with the West Hartford Summer Arts Festival, the Summer Place Players, and Playhouse on Park, most recently in their production of The Last Five Years. Other musical direction credits include Singin' in the Rain, Fiddler on the Roof, The Scarlet Pimpernel, Joseph and the Amazing..., and Sweeney Todd. In addition to his responsibilities at Hartt, Mr. Britt currently serves as the interim director of music at Marquand Chapel at Yale University and as the assistant music director at the Cathedral of St. Joseph in Hartford.